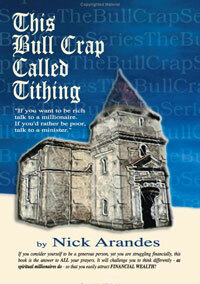 I just finished the book, “This Bull Crap Called Tithing” by Nick Arandes. He had an interesting perspective on the issue of stewardship, money, and tithing. Some of the excerpts on the back of his book say, “How to attract unlimited wealth”, and Secrets of tithing that churches will not tell you. Truthfully i don’t remember the whole secrets of tithing that churches will not tell you part, but i do remember his attracting wealth section. in a general sense he talks about how we think its greedy to want more money. In a sense he says so many tithers don’t have money and are broke all the time and struggling paying bills because they are always giving it away. He kind of goes off of common sense here by saying that if you give it, you won’t have it. In a sense that is true, and i agree. i have seen that first hand in my own life and in my family’s. As a child i remember my father being strict about giving our tithe to the church. Even if bills were not being paid, the tithe went to the church. The part i don’t understand about that is, he’s giving money so others can pay their bills, but that’s the logic of those who fail to see principles of stewardship because they are focused on task oriented christianity. 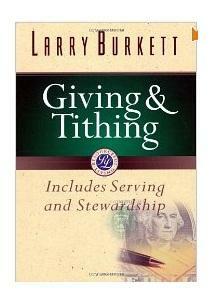 In this book he tries to attract the attention of people who tithe and tithe and are always broke. I don’t really care about the title. I think some authors make up titles like that to attract people’s attention (obviously it attracted min). Anyways, I think what he’s saying in the title is for those who think tithing is a magical obligation that you can do to gain financial security. So what people are realizing is that if you do give it away then guess what that means you don’t have it. It’s not like the stock market where you get a financial return on your investment. If tithing was the answer to exponentially grow your wealth, then it would be more popular than the lottery. Think about it this way. According to statistics(links below), the Jews are the richest nationality/religion in the world, and yet they don’t believe that tithing is commanded for them. That’s odd, don’t you think? You may think it’s because they are God’s chosen people and so on, but really although they are wealthy they are not a fortunate people. Just Look at the turmoil that country is in. I hope this book review could help you making a decision on a book you want to buy on stewardship. I give this book a 2.5 out of 5 stars overall. It had some good points but i had mixed feelings about it. “ticking off”(my term) God and what HIS intentions are……..very interesting times! The “fact” as you say they do not believe in tithing is another form of current rebellion against what God intends…..for Massianic Jews do tithe I believe and have correctly administered to God …His rightful portion. she taught me that God is in control of all things. Sometimes I think we “nit-pick things” to death…..LOL God is a simple God with Great love and compassion and just wants us to understand that if we “lean on HIM” he will take care of us……and tithing to me is an expression of faith in that matter. Thank you for your contribution here on this blog. I try hard to bring in a larger focus of stewardship into this website. If we do not learn the greater concept of stewardship first, then it does not matter if you give by tithing or spirit-led. The Jewish land is in turmoil and it is in reflection of their sin as you say, but overall their financial success is unprecedented. If the Malachi curse is correct for the new testament, then why are they so blessed. Is it because God blesses on your faith not because of the obedience in giving an old testament law? I use Jewish giving as an example because a majority of the Jews do not believe in tithing, but are still the most financially blessed nationality. If Malachi 3 is still a curse upon us for not tithing then why isn’t God still enforcing it? When in Doubt consult your Bibles the Authorized ones not the ones Cults have altered and added to. No one but Jesus could keep the law with precision and perfection. This is why we needed a Savior to fulfill the law for us -(Jesus)- He paid in full everything we need. Ask God in Jesus name for what you need. If you are in His body of believers he will freely give you all things without your working to pay for it. This is the definition of Grace. Bible Theologians will explain that Grace is Umerited ( undeserved & unearned) Favor. We were sinners without strength to save our own selves when Christ died for us. This means keep all 613 laws perfectly. Jews had laws to keep around the clock on what to wear, eat, say and do. Thank God Jesus said, “it is finished and fulfilled” for the body of Christ. Unless you are a Jew living under the Old Covenant keeping the tithe law did not apply to you at all. After Jesus died there is no more mention of keeping the tithe command or any Old Testament law or Feast for justification or favor from God. Your Unmerited favor comes from the finished work of Christ. The promises of God are Salvation and everything else you need can be granted by God in Jesus name. Because of pride people feel they must earn favor by their own efforts. This is what Cults believe- that their good works are what saves them. Some Tithe propagandist are saying the Abrahamic Covenant is what the Body of Christ has inherited and since Abraham paid tithes we ought to as well. First Abraham did not pay anything what he did was voluntarily give a tenth one time only. Pastors do not consider tithing one time as faithful tithing consistently. Second the Abrahamic Covenant was unconditional. God even put Abraham to sleep when he cut the animals in half and walked through them as a Covenant sign. Deut 12:15. They use Matthew 23:23 but Jesus was speaking to a Jewish audience before he fulfilled the law on the Cross. Jesus kept the law for us and fulfilled all 613 Jewish requirements because mortals failed at doing so. Sorry Tithe Police your twisting of Scriptures has too many holes. Oh and they also say tithing was before the Mosaic law was given but so was circumcision and I never heard a Preacher say Christians must circumcise all male babies on the eight day! Stop twisting Scriptures some of us can think and read the truth. We are not all unthinking Robots! Thank You SQ for the clear and simple teaching to help set christians free from the lies and deception that is preach all over the world for financial gain. Please read and study the scriptures that was given to free you from condemnation and guilt. JESUS DID NOT RECEIVE TITHES, AND WE FOLLOW HIS EXAMPLE WHEN HE WAS HERE. The Jews here on earth are financialy blessed all over the world, none of them is tithing because there is no more Levites here to receive their tithes. Honour God with your money but please stop bragging about your 10 percent pride trip. You’re right, Jesus did not receive Tithes because He was not a Levite. God’s command was that the Tithes went to the Levites as their inheritance (Numbers 18:24). 1) The Temple would need to be rebuilt. 2) Only Jews growing/raising food in Israel would Tithe. 3) They would give the food Tithe to the Levites. Since the Levitical and Aaronic Priesthoods have been replaced by the Melchizedek, any Tithes offered today would VIOLATE the Mosaic Law. Abraham’s Tithe in Genesis 14 was not a Tithe. It was merely a tenth of the spoils he gained from someone else. Abraham gave 10% to Melchizedek, paid his friends for helping him and covered his own expenses, then gave the rest back to Sodom, keeping none for himself, “Tithing” none of his own possessions (he was already “very wealthy” – Gen 13:2), and never “Tithing” again. Hebrews 7 is not meant to carry the Tithe (all by itself, while ignoring the other 612 laws) to the New Covenant. It was meant to show that Jesus (not a Levite) is Priest, a higher and better Priest than those of Levi and Aaron. Malachi 3 was written to Levites who withheld the “tithe of the tithe” from the Aaronic Priests. It was not written to modern Christians. It is part of God’s Old Covenant, and does not apply to us today. God made a NEW Covenant with us, one where all we need to do is believe in His Son and give our whole being over to Him. God’s blessings do not have a 10% price tag, and can NOT be bought with money. Nor should we seek our reward here on earth. Our reward is in Heaven, and we should not seek blessings here in this kingdom, which is passing away. Those who advocate the modern teaching of the Tithe do not uphold God’s Word, but instead, violate it. The only way to support this doctrine is change Scripture to make it say what you want, instead of letting Scripture change you. Giving to support the Church is fine, but Tithing (as we know it) is NOT Biblical. “You who are trying to be justified by law have been alienated from Christ; you have fallen away from grace.